Published Feb 15, 2016 by VMware Press. Part of the LiveLessons series. The target audience for this course consists of IT professionals who want to understand the VMware NSX platform, its security, and network virtualization capabilities. The product focuses on theoretical and practical configuration. Users should have some background in IT, networking, and vSphere. This lesson covers the concepts of the software-defined data center (SDDC) and the transformation happening in this space. Focus then shifts to the role VMware vSphere has in providing the foundation for network virtualization. This lesson provides the networking foundation needed for viewers with a non-networking background to understand the fundamental capabilities of modern data center networking. Topics include Ethernet switching fundamentals and vSphere virtual networking, including distributed switching and network topologies. This lesson focuses on the topology used throughout the rest of the lessons and describes the conceptual, physical, and logical networks. This lesson includes reference material for subsequent lesson units. 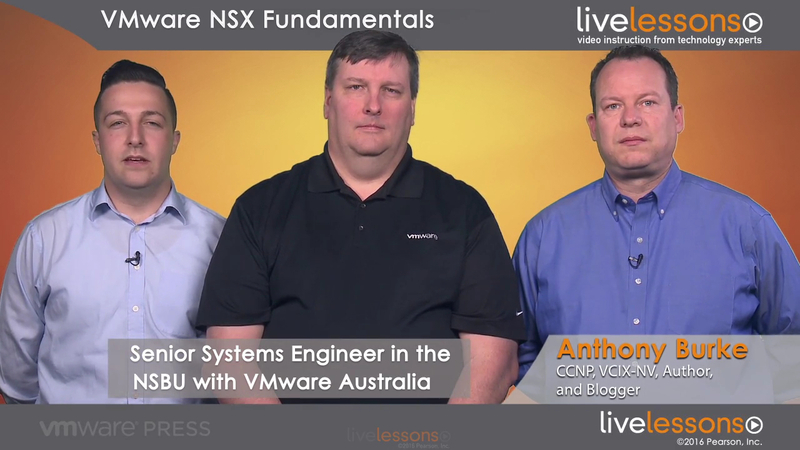 This lessons introduces the management and control plane components of NSX (NSX Manager and NSX controllers) and describes their purposes in the architecture. It also details various best practices for each. This lesson focuses on the first building blocks of virtualized networking, logical switching. Topics include VXLAN protocol fundamentals, VTEP functions, traffic flows for broadcast, unknown unicast and multicast traffic, and the ARP suppression capabilities within NSX. Additionally, this lesson examines controller replication modes along with Top of Rack integration via the OVSDB protocol. This lesson provides information on the routing capabilities of NSX, including static and dynamic routing with OSPF and BGP. The lesson also explains the NSX Edge and DLR routing capabilities and shared best practices around the DLR route control virtual machine. This lesson covers NSX Edge Services Gateway routing features, including static and dynamic routing with OSPF and BGP. The lesson also compares and contrasts high availability modes and shares best practices on scale and placement of the NSX Edge appliances. This lesson describes the use cases for the VPN offerings available in NSX before focusing on each available option. The lesson covers site-to-site IPsec VPNs, SSL VPNs, and Layer 2 VPNs and provides best practices for each. This lesson focuses on the NSX load balancing capability. Topics include one-armed load balancing, in-line load balancing, SSL offload, and service profiles. This lesson covers the concepts of micro segmentation and the zero-trust model. The lesson continues with a description of the architecture of the distributed firewall compared to traditional firewalls, and concludes with a look at the installation and configuration of the distributed firewall. This lesson introduces the NSX Service Composer tool and illustrates how to configure security policies. It also explains and demonstrates third-party integration using Service Composer. This lesson provides information on functions available in NSX including L2 bridging on the distributed logical router; NAT and DHCP configuration on the Edge; and data security and activity monitoring across the platform. This lesson focuses on the new components and architecture added with NSX 6.2’s Multi-vCenter capability. The lesson explains and shares best practices for migration from a single vCenter deployment to Multi-vCenter. This lesson focuses on operational aspects of NSX, including roles-based access control, NSX flow monitoring, NSX activity monitoring, logging capabilities, and new path troubleshooting tools. View all LiveLessons on InformIT at http://moko-kurzhaar.ru/?page=livelessons.